Well, life derailed some of my knitting plans last week. (Unfortunately, I am unable to knit teeth to replace the two that my son had broken or a new camera to replace the one that I managed to drop. Knitting is also very little help in preparing tax returns, although I find it quite effective to combat the stress of doing so, especially when combined with wine.) But even though last week wasn’t the best week I’ve had, the weekend ended on a fabulous note. On Sunday, I headed up to the Knitting Boutique, a fabulous yarn shop in the Baltimore, MD, area, to attend a Knitwear Design Class with Shirley Paden. It was, in a word, incredible. 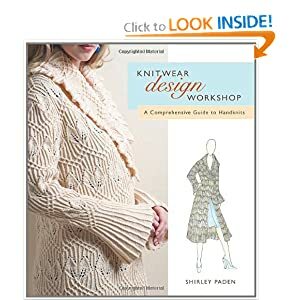 I have Shirley’s book, Knitwear Design Basics, which I highly recommend if you’re interested in designing your own patterns. And if you are lucky enough to have the opportunity to take this class, take it! It was wonderful to be able to sit down with Shirley and ask questions about the things that puzzled me. To prepare for the class, we had to sketch out a design and knit a large (8″x8″) swatch in our chosen yarn & stitch pattern. I have a sweater’s worth of Miss Babs Yowza – Whatta Skein! in a gorgeous tonal purple (colorway “lilacs”) that I purchased at Rhinebeck last fall. I’ve been pondering the yarn for a while. I knew I wanted to make a scooped-neck cardigan, something fairly simple and classy, that would go with either jeans and a tee-shirt or with slacks and pearls. I envisioned something that was mostly stockinette, with a little bit of lace on either side of the button band to add a feminine touch, with matching lace panels on the back. With my limited (!!!) artistic abilities, I drew out a simple sketch. I knit a couple of small swatches in stockinette, trying out various needle sizes. I decided that size 7 needles gave me a fabric that was nice and drapey, but not sloppy. So I knit my larger swatch with those needles. The lace portion proved a bit more problematic. I had seen a sweater that had a lace pattern that I liked, but I didn’t have that pattern to refer to, so I had to do a bit of detective work (and a ton of swatching!) to work out a lace pattern that I was happy with. (Interestingly, I did eventually stumble across the other pattern in a book at my LYS, and I discovered that I’d approached the lace pattern quite differently… and I liked mine much better!) Unfortunately, I ran out of time to make a large swatch in stockinette and the lace pattern, but as I was able to get a full-width lace panel in my smaller swatch, I think it will work out fine. I blocked both swatches as I would the finished sweater; I treated both to a nice, long soak in Eucalan, then spread them out on my blocking boards. I did run blocking wires down the sides of the swatches, to minimize curling, but I didn’t pull them tightly, just patted them gently into shape and let them air-dry. 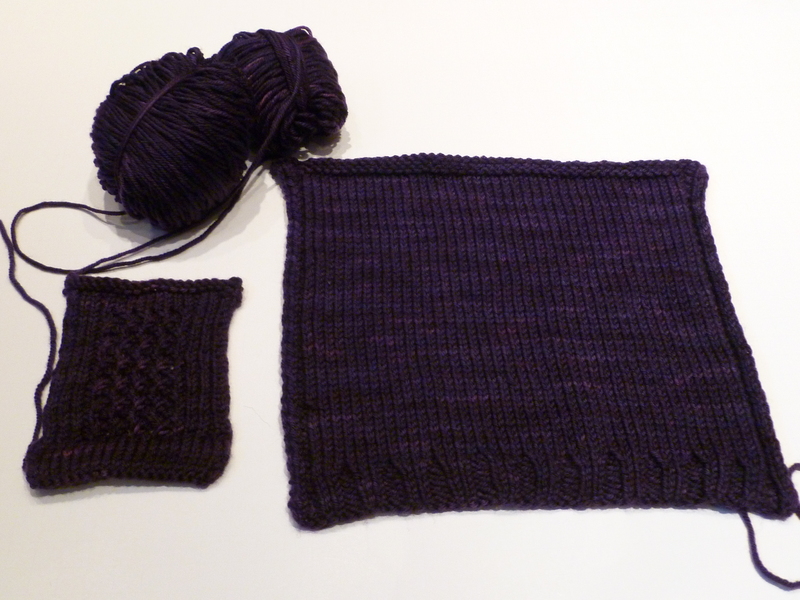 A note on swatching: Shirley advocates knitting a really large swatch, at least 8″x8″. She says that you hold the needles and manipulate the stitches differently for a large swatch than you do for a small swatch, and you want your knitting experience to be as close to the actual project as possible. This approach agrees with what I found with my Lanesplitter swatch, so I’ll be doing this in the future! I took my sketches and my swatches with me on Saturday to the class. 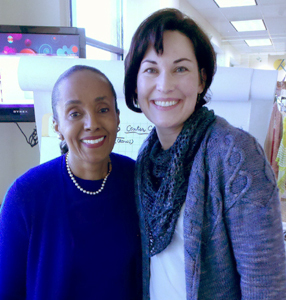 Shirley Paden is both a lovely woman and a dynamite teacher. She walked us through all the calculations we’d need to taper a sweater at the waist or the sleeves, transition from a border at one gauge to a sweater body at another gauge, or evenly bind-off along a neck edge. (Knitting math, yay!) Along the way, she shared a ton of advice and knitting standards that we can use to create our own patterns. At the end of the class, we had a few minutes to take our measurements, so we can customize our pattern for a perfect fit. By the time I got home, I was exhausted (the time change and losing an hour of sleep didn’t help! ), so I put on my jammies, knit a few rows on the Lanesplitter, and called it a day. 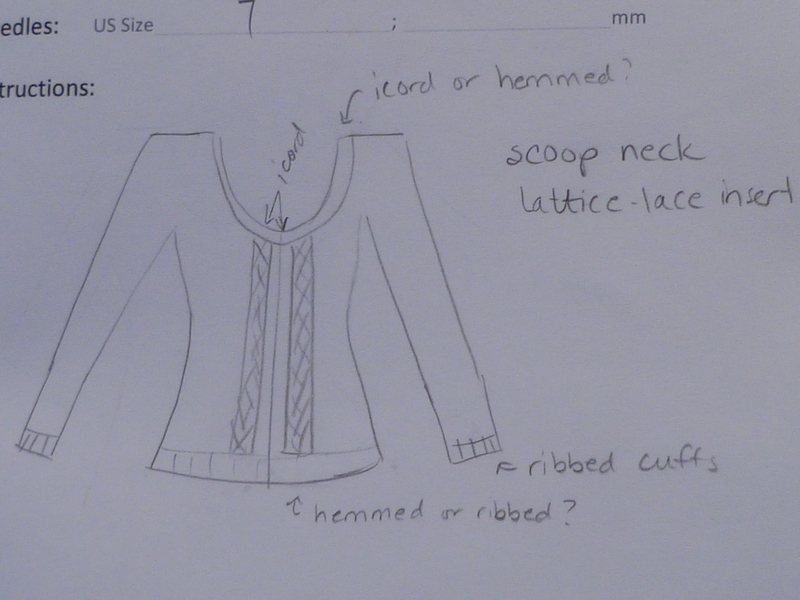 I have to finish up some of my current works-in-progress, and then I can dive into designing this cardigan in earnest!